Maya tablet of the Sun, Maya Art, Maya, precolumbian reproductions, mesoamerican reproductions, arte maya, mayan art. Temple of the Sun, Palenque, Mexico. 692 A.D. 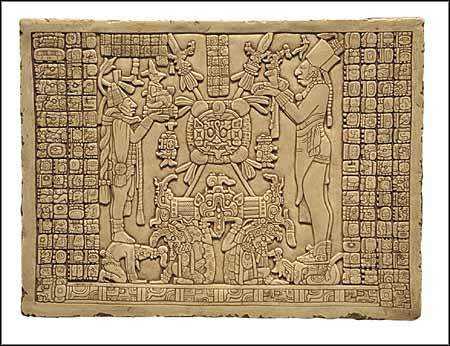 The original of this tablet is located at the Temple of the Sun, one of the three temples in Palenque known as the Group of the Cross, built by king Chan-Bahlum to commemorate and celebrate his accession rites to the throne after the death of his father, king Pacal. The tablet shows king Pacal on the left side, dressed in burial apparel and holding a full-bodied eccentric flint and a shield made of a flayed human face, a symbol of war. Pacal still holds the insignia of royal power; the passing of authority will occur at the end of ten days of accession rites. Chan-Bahlum is shown on the other side holding an offering manequin of maya god "K". At the center of the tablet, we see a Sun Jaguar shield and crossed spears supported aloft by an underworld throne with bleeding jaguar heads emerging from one axis, and bleeding snakes from the other, representing decapitation sacrifice. The throne rests on the shoulders of god "L" and another aged god from the Underworld. Both are bent over like captives, in representation of the defeat of the Lords of Death at the beginning of time by the Hero Twins who became the source of life through magical rebirth after becoming captive sacrificial victims.